Wow, that's a weed! 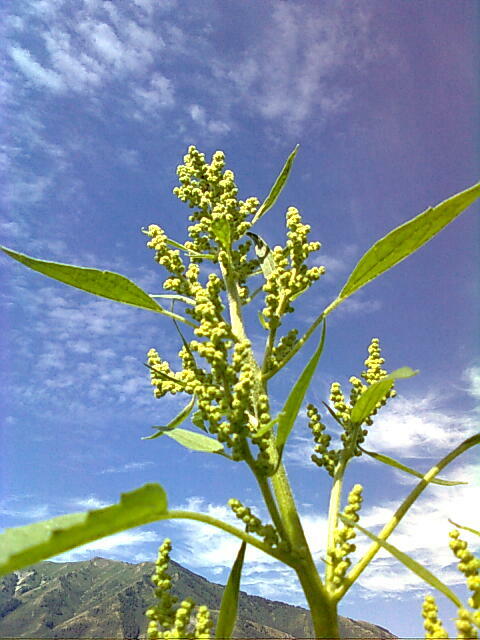 The leaves resemble Xanthium spp., but our Xanthiums never get that tall. Is it something new in your area? Absolute minimum: -28 degrees Celsius; Average minimum: -16-18 C; Average frost-free period: 20 April to 15 October; Usual high temperatures during summer: 33 to 36 C (rarely up to 40 C); Average annual rainfall: 600 mm. 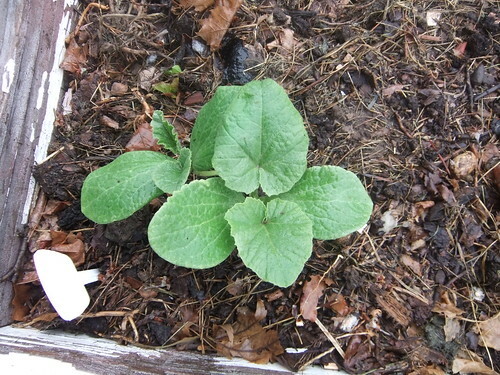 This weed only grows in one of my fields and not in any of my backyard gardens. It is not Xanthium. The leaves are very bitter tasting. I'll try to catch it while flowering. I guess I aught to maintain better hygiene when I move the tiller from field to field: Make sure I wash it between fields so I don't move these seeds to another field. I'm lazy that's why I work with nature. Love what you used for scale. Garden is a clearing in the woods grading from shallow, rocky soil supporting a maple bush to a pine forest planted on sandy soil and a clay bottomland with spruce and tamarack. 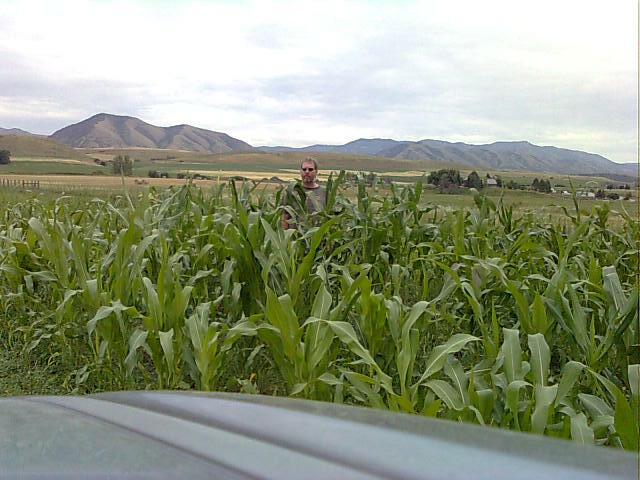 Here's a photo of what my F1 [Indian Corn X se+] corn patch looked like a few days ago. Mothers included Pink Hopi, Blue Hopi, Taos, Anasazi, Earth-tones Dent, Peruvian Morado, and a number of Indian corns collected from farm stands and home gardeners from around the Internet. 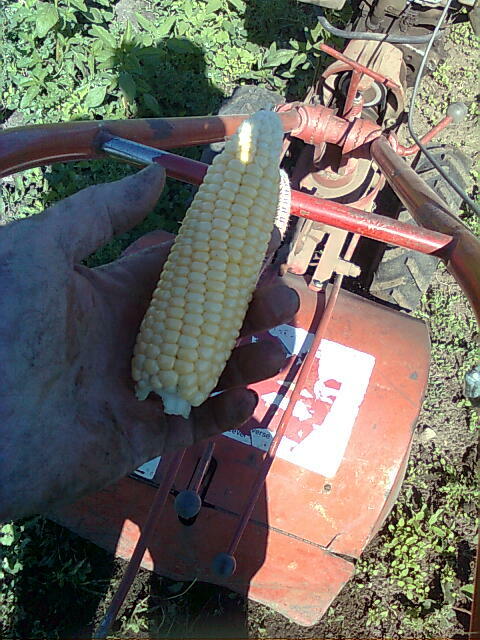 There are also a couple rows of 100% se+ dehybridizing (F2) sweet corn, and a row of cherry flavored sweet corn. Based on the flowers of my mystery weed. I am tentatively identifying it as a member of the amaranth family. The height of the camera was 6 feet. Could you would you taste it? Perhaps it's a worthy plant? The wild amaranth are nasty bitter-tasting fibrous plants. I was sick to my tongue for some time after eating it. No gentle lick for me, just shove a wad in and start chewing: It's an amaranth after all, what could go wrong? On a happier note. I harvested my first two cobs of corn today! It is an F1 hybrid [Long Island Seed Project's Ashworth X Precocious-se+] that I crossed last year. It is the corn that I grew under a floating row cover for a while. so now we know the rest of the story. Joseph buys corn at the store to do market research. He eats the corn and decides the store is doing a good job of marketing. Joseph, most of the corn in stores these days is a synergistic sh2 that can run up to 50% sugar. When I test it, most of the corn I get at the grocery store contains the shrunken gene. I haven't been testing for synergy with sugary enhanced. 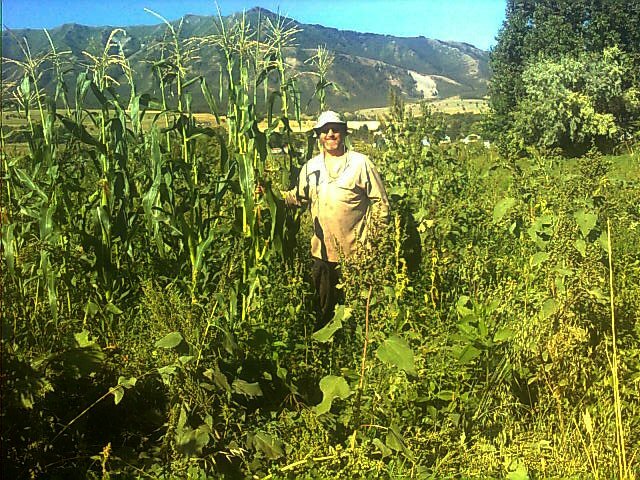 I ate some cobs of painted mountain flour corn today in the field. They tasted much sweeter and better tasting than the one I got from the grocery store yesterday. They were tough though and very chewy., even crunchy. I need to harvest my Cherokee Squaw X Silver King. I've pulled half a dozen ears and they are ready now. I am getting 1/4 su kernels but roughly 3/4 of the cobs are red and 1/4 are white. I'm probably going to select for large ears and mostly use the kernels from white cobs. 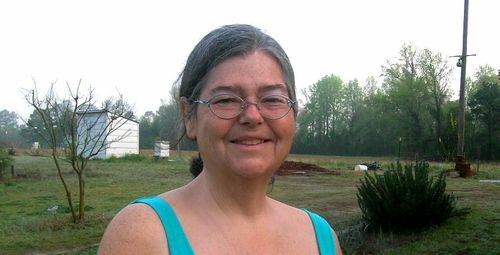 Next year will be the big year for self-pollinating plants. I need about 200 plants selfed so I can see which are se+. I got the Cherokee Squaw x Silver King harvested today. I should wind up with at least one bag of seed that show the su phenotype and another 2 or 3 gallons of seed that are typical dent shape. I deliberately harvested the corn a bit early because we had excessive rainfall the past 2 weeks. A few ears were obviously immature on about 10% of the plants. I will cull these since they represent late season maturity which I choose to select against. About 2/3 of the cobs are red to pale red. I will save seed from them separate from the seed from white cobs. With any luck, next year will see me putting bags on a few hundred plants so I can self them and select the su/su se/se plants. In other words, plants showing high sweetness from the combination of su and se genes. Here's what my [Cherokee Squaw X Silver King] corn looked like this morning: It is a few days away from fresh eating stage. It has been in the ground since May 17th. I'm expecting the first fall frost within 1-3 weeks. It might actually produce viable seed before frost. It's pushing the limits on DTM that is acceptable for my climate. The cobs are huge... It grew more vigorously than Silver King (in past years), and seems to have a longer DTM. The hand of that cute farmer is resting on a cob 4.5' from the ground. It looks a lot like a member of the goosefoot family - Chenopodiaceae - although they seem to have been merged into the amaranths recently. How peculiar. They don't share all that many traits with the amaranths I know. 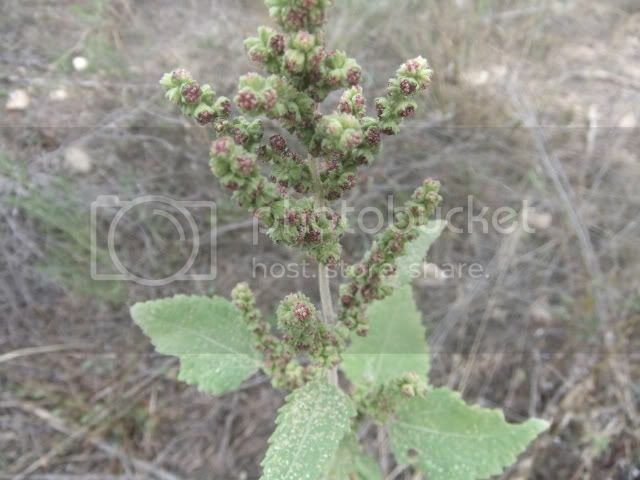 If I had to guess, perhaps it's Giant-seeded Goosefoot (Chenopodium simplex)? I believe it's found in your area. I am also curious to know if it is actually a amaranth. I took a picture of what i think is the same plant in my area now that it is blooming, and i have to say that it doesn't really resemble the cultivated amaranth all that much. There are some similarities i guess. Joseph, what is your update is for the Cherokee Squaw X Silver King.